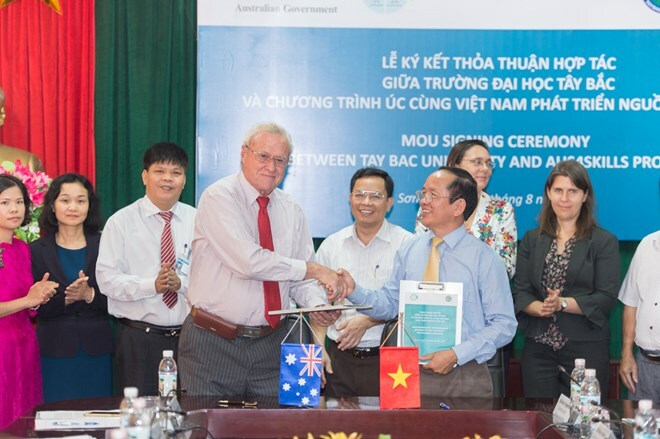 Hanoi (VNA) – Tay Bac (Northwest) University and the Aus4Skills, an Australian programme supporting Vietnam’s human resources development, signed a cooperation agreement on August 29, laying a foundation for a series of joint activities until 2020. The cooperation aims to improve the university’s leadership and management, reform curriculum and teaching methods, increase academic support for disadvantaged students and promote women’s leadership. About 80 percent of the students at Tay Bac University, located in Son La province – a disadvantaged locality in the northwestern region of Vietnam, are ethnics. Rector Nguyen Van Bao said the Australian Government’s support will help his university train skilled manpower, thereby better meeting the labour market’s demand and contributing to economic growth in the region. With that assistance, Tay Bac University will set up long-term partnerships with Australian universities. Australian Ambassador to Vietnam Craig Chittick said his country pledges to assist Vietnam’s human resources development in various ways, including through support for Tay Bac University. “We believe that with strengthened university management, reformed curriculum and teaching methodology, Tay Bac University will be able to provide better academic support to nearly 4,000 ethnic minority students. This will increase the success rate of ethnic minority students at the university and help them get better jobs,” he said. Aus4Skills is also going to sign similar cooperation agreements with Thai Nguyen University and its University of Agriculture and Forestry in September.